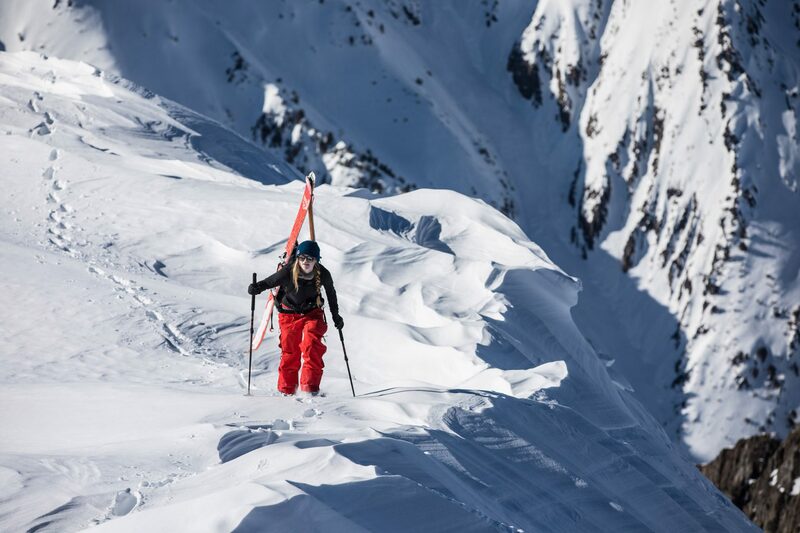 Michelle Parker has spent nearly half her life as a professional skier. 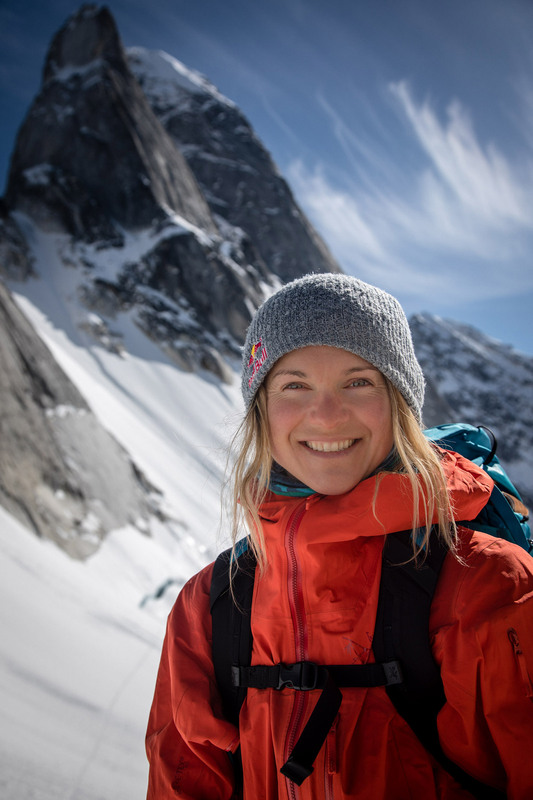 From a childhood spent chasing her heroes around the mountains of Lake Tahoe, California, she’s grown into a ski hero herself, on a path that traced the growth of women’s freeskiing competition before expanding into the backcountry and big-mountain realms. We asked Michelle to tell her story of building a career in skiing, and the changes she’s seen along the way. It was your typical sunny California spring day at Squaw Valley. I was hanging with the boys and lapping the park with my first pair of twin tips, braid dangling out of my helmet, pants far too big and poles too short. I was fifteen and had recently decided not to be a ski racer anymore. I couldn’t justify spending my parents’ money on something that I was slowly losing passion for. I longed for powder days with my friends lapping Squaw’s KT-22 lift and the freedom to go wherever I wanted to on the mountain. The confines of the race course weren’t satisfying those desires. Growing up around Shane McConkey, JT Holmes, CR Johnson and many other sponsored athletes, it was hard not to fall under their influence. I’d chase them around the mountain at a young age and then go home and watch the latest Matchstick Productions film, eyes wide open in wonder and curiosity about the scene that was taking place around me. On this particular spring day, I was approached by a man named Jason Levinthal. He stopped me and handed me his business card after I greased the flat bar in the park and was speeding away for another lap. Jason Levinthal, it read, Owner of Line Skis. “Give me a call, I’d love to get you some skis,” he said. An unsurmountable stoke started brewing inside me. A free pair of skis? He said he thought I was a boy until he noticed my braid. Jason groomed the road ahead for me by taking me to my first slopestyle competition, the US Open in Vail, Colorado. I didn’t really even know how to do a 360, but I had rails on lock and quickly learned to spin before my debut slopestyle run. I left inspired to learn more with a reinvigorated passion for competitions. I followed that path for several years. I placed well and was invited to the first ever women’s freeskiing event at the X Games. Back then it was just halfpipe, which certainly wasn’t my specialty, but I gave it everything I had. I stood in the start gate with all of the lights, crowds, and buzz around X Games, next to CR. He took me aside, asked me if I was nervous, and told me to just have fun because that was what it was all about. After hearing that, I dropped in with a massive smile on my face. I knew I wouldn’t win, but I was going to have fun. Near the end of the pipe, I pointed it into the left-side wall full speed, ready to send. I hit the lip and popped into an alley-oop flatspin, a trick I had never tried before. The crowd went wild, and even though I missed the landing, I burst into laughter because I was having the time of my life. It was simple back then. You showed up for competitions and did your best, attended the occasional photo shoot, and tried to luck out and join a crew that was filming. I started working with Poor Boyz Productions and began to love filming more than competing, although I still did both. There was time for it all. I was still young and felt invincible. At eighteen I had my first knee injury, a clean tear of the ACL. That’s when it changed for me. I learned how to appreciate my health and my body. I took care of my knee and came back with a fire inside to win the first comp I entered, the Aspen Open. Women’s competition was growing: there were now far more than the usual eight or so girls to compete against. Slopestyle skiing was starting to feel like a real sport. Right after competing in the X Games, I finished high school early and asked my dad if it was okay with him if I took a year off before college. I wasn’t ready to go, and my focus was all on skiing. I had been making a little bit of money and it was beginning to feel like I could make this passion into a viable job. One year turned into two and then three, and by that point it was a full-fledged career. Managing a career when you are young takes practice, trial and error. I admittedly dropped the ball at times, but I always took opportunities and still do to this day. Times have changed since then. We now have more opportunities than we used to as a result of social media. Fans have a direct link to their superstars through these platforms on our phones, and it’s our choice to reach out, engage and interact. We can choose how hard to work, how much effort we put in, and finding that balance has been key. Athletes like Cody Townsend, for example, propose social media trips where the athlete creates all of the content. These types of trips are driven by passion, and we get to be in charge of the content created and how we portray ourselves to our audience. It feels empowering and, as an athlete, there’s more opportunity to collaborate with brands and be creative. We have outlets for this creativity and a platform for our voice. More and more athletes are getting involved in political matters, standing up for the environment and using their voices to push for change. This was something that kept me going at the beginning of my career. At first I thought that this path was selfish, but now I’ve found purpose behind what I do, and it’s motivating. If I can use this platform to spread a positive message, inspire men and women alike, and speak up for issues that I am passionate about, then at the end of the day it feels like something of more value than just submerging myself deep into the mountains in search of endless powder. As athletes we have an opportunity to create a positive change, to be a part of something bigger than ourselves. As for myself, I co-founded an avalanche clinic with three other professional skiers, Elyse Saugstad, Jackie Paaso and Ingrid Backstrom. This event, called S.A.F.E.A.S., was created in an effort to spread the message of safety and avalanche awareness, and has included over 750 participants so far. We wanted to make a space for women in particular to learn in an encouraging environment. Others have been active as well: Chris Rubens and Eric Hjorleifson host similar camps and clinics in Canada, and over ten years ago Jeremy Jones founded Protect Our Winters, a non-profit committed to mobilizing the outdoor sports community about climate change. In September, members of P.O.W. including myself traveled to Washington, D.C., to lobby and speak in person to our policymakers about climate change. Not your typical lobbyist. Yesterday was my first time to Capitol Hill with @protectourwinters and certainly not my last. We spoke with a number of republicans about climate change and attended the Bi-Partisan Climate Solution Caucus where members from P.O.W. eloquently shared personal experiences. It was heart warming to be in a room with representatives from both sides coming together to talk about the impacts, causes, and challenges of our changing climate. It was very clear that our group of outdoor enthusiasts were a breath of fresh air. Our voices were heard and I would encourage everyone to speak up, make phone calls, write, and communicate with policy makers about issues you care about. Check out protectourwinters.org for a road map on where and how to begin. Thanks to @repcurbelo and @repteddeutch for founding the Climate Solutions Caucus. It was an honor to visit Capitol Hill! As an individual in the action sports community, it’s deeply inspiring to know that we can make a difference. In my fourteen years as a professional skier, these changes have brought about a new direction in my career and in many others that I have witnessed. Being more and more involved as an athlete gives you more added value for companies to work with you, so really it’s all in your hands to make things happen. Let’s not forget that skiing as a whole has progressed into a fascinating world of separate disciplines. No longer can you be the best at every aspect of skiing, or even just really good at many different avenues. I used to compete in slopestyle and halfpipe while filming on the side. Now I keep my focus on filming, as there is simply not enough time to do all of the above. While the youth is primarily focused on competitions, we live in two very different worlds. How do you bridge the gap? Sammy Carlson is an athlete that I admire for doing both successfully for a really long time. 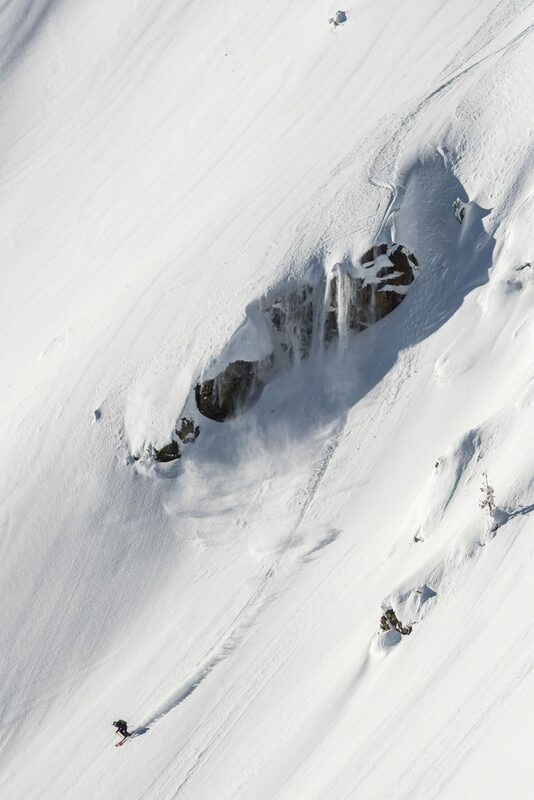 He’s morphed into a master at choosing natural terrain to trick off of. I had the pleasure of skiing with Sammy last year, and witnessed firsthand his incomprehensible level of skill. For the most part however, the film athletes will be found in the mountains fueled by the endless chase for deep snow and high peaks, and the competition athletes are traveling the globe to competition after competition, staying sharp on the latest new doubles and triples. These two worlds, seemingly worlds apart, rarely cross paths, but when they do it’s still the shared passion of sliding on snow and catching air with style that brings us together. For me, my passion for skiing is constantly developing and always changing. I suppose that is what has kept it fresh, new and exciting. Gone are the days of lapping the park. Now my attention is on exploration, dreams of un-skied peaks in far-off lands, and the means to approach these mountains in a safe and collaborative way amongst my team of mountain partners. I’ve found more depth, deeper bonds, and deeper snow in my new exploits, but I’m not saying that I don’t still love taking a few laps in the park. At the root of this passion, skiing and the feeling of freedom that it gives me is the same. While the world may change around us, it’s important to hold onto those fleeting feelings that keep the fire inside lit.